This article is a continuation from last week of the slaves named in the 1861 divorce of John H. Crisp and Mary R. Bowles, widow of Green Berry Bowles. The names of these slaves were transcribed by Annette Bowen, one my colleagues in the Bay Area Genealogical Society of Houston, Texas. So it appears that these slaves were probably emancipated in Lafayette County, Mississippi. Searching for blacks named Bowles in the 1870 census of Lafayette County, Mississippi we found 62 people with that name. There were seven more persons named Bowles identified as mulatto. There were no former slaves named Crisp in Lafayette County in 1870. The original BOWLES PLANTATION which was divided between the children at time of the father, James E. BOWLES death [WILL proven in Nov term of Court in 1840] was abt. 1280 acres, [Section 6, Township 8S , R 2W and Section 12, T. 8 S R. 3 W. on both sides of the Old Woodson Ridge Road now known as C. R. 215. His son, Green Berry Bowles Plantation was between Graham Mill creek and Cambridge Church with abt 4500 acres. Green Boles Sr.'s Plantation was northeast Quality Ridge now known as Woodson Ridge as well as some property near College Hill. 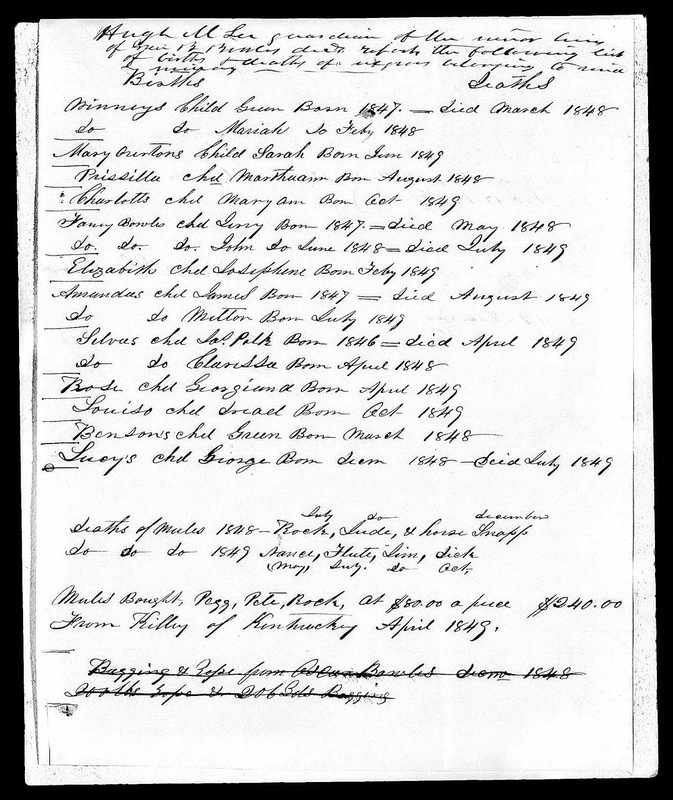 In the Mississippi Wills and Probate Collection at Ancestry.com there is a probate for Mary R. Bowles that was administered by her oldest son, James R. Bowles. Here land is described lying in Lafayette County, Mississippi as 450 acres of Section 29, Township 7, Range 2 including the northern portion of the section and the SW 1/4 of Section 20, T. 7, R. 2. Her estate was insufficient to pay her debts and was declared insolvent. 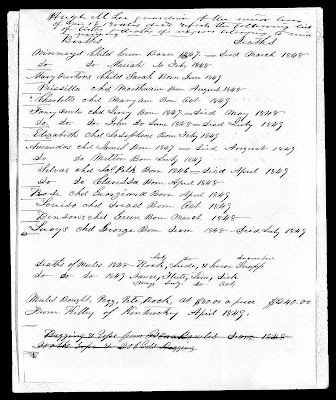 Further searching of Mississippi Wills and Probate Collection at Ancestry.com found another slave list in the probate for Green B. Bowles Sr. This is a great example of the gold that is buried in the new Ancestry.com Probate collection. This list appears to be an update to an earlier list showing additional slaves that have been born and some that have died since 1846. This list is especially useful as it includes the names of the mothers and the dates of birth. The list goes on to describe mules and horses by name acquired or died in the intervening period. It is also heartbreaking to note that of the 16 children born, 6 of them had died young. Hopefully someone will be able to use these lists to solve their "Ancestor Puzzle."